We are doing a little jig, ok a BIG jig, over here at the Pink Cart team headquarters because we just BLEW through a financial goal of raising $250,000 for the American Cancer Society!!! THAT is a lot of money and we know that every penny is going to the important work of research and breast cancer awareness across this great country. 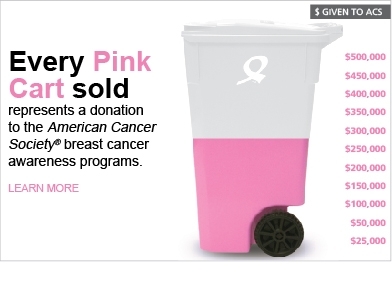 Did you know that when you buy a Pink Cart in your community your $5 makes it back there? Every three months when we remit our donation to the American Cancer Society we staple it to a spread sheet that lists every City and zip code where a cart was purchased because ACS has offices everywhere so the funds are sent back to the community in which they were raised. That means that by buying a Pink Cart you are helping to fund awareness programs in the community in which you live. You are impacting the women in your community, how cool is that? We think it is amazing and we want to THANK YOU, our friends, for making it possible. Special shout outs to Lakeville, MN, South Sioux City, NE, City of Gloucester, NJ, Sayracuse, NY and Spokane, WA for helping us to turn curbsides pink across America. As the song goes "we've only just begun" so spread the word and keep on buying PINK!